JD's name is Jose D. DeAnda and he was born in San Francisco. 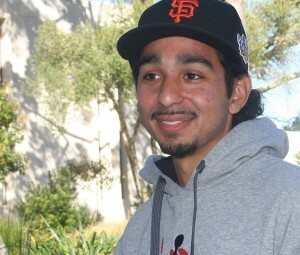 JD grew up in South San Francisco attending All Souls from K-8, then went to Sacred Heart Cathedral High School in the City. At 24 years of age, he is the youngest of 3 brothers. JD is a first time member of the Skyline View. He brings a special skill set in digital media but also would like to sharpen his skills in writing. JD frequently expresses his knowledge and passion for sports but always wished he could make a living off sports gambling. Music is his real passion in life. His dad grew up playing music and more than half of JD's friends either play music, rap or are artistic. At San Jose State University, JD found radio to be very interesting. Soon after a quick stay on KSJS, he enrolled at the College of San Mateo and became an intern at KCSM Jazz 91.1 for two years. Now JD has visions of wanting to start his own Hip Hop radio station. In spring 2014, JD will be graduating with a A.A. in Interdisciplinary Studies: Arts & Humanities and plans to continue his education in the Bay Area. JD plans to study Geography and dreams of working for national geographic or any job that involves traveling. That is all with due time, right now JD just wants to be apart of The Skyline View and give his shot at journalism.